Sometimes, an application that you downloaded from the internet comes in bundled with adware, usually in the form of ad banners, while others as third party components that can change the settings of your browser without your consent. If you have such an adware infested PC, Bitdefender Adware Removal Tool just might be your savior! Bitdefender Adware Removal Tool is a freeware that has been designed to remove potentially harmful adware, malicious hijacker programs, annoying toolbars and browser add-ons. It identifies such potentially unwanted programs, then you can select the programs that you want to get rid of. The adware remover works lightning fast. You can directly run the executable file, without a need of installing it. The program is portable, though comparatively large at around 41 MB, and comes as an executable file. It has a simple and straightforward UI. All you need to do to launch the program is to accept the user agreement and click “Get Started”. You will be directly taken to the Scan UI. Before starting a scan, I looked for configuration settings with the hope that I would find some advanced/custom options. The tool is completely devoid of any options or preference settings that can let you choose between scan types, or custom folder selection for scan. All you can see is a single button to scan the entire system! All in all, the minimalistic UI design ensures fast and smooth execution of the scan. Nonetheless, the tool is still in its beta stage, so we might see some changes or improvements in the final version of the product. Setting up Bitdefender Adware Removal Tool is super easy. In fact, you do not need to! Because you will be able to scan your PC as soon as you launch the executable file that you have downloaded. As mentioned above, it has an intuitive interface and clear options. The scanning interface is extremely simple, with no other options except the Scan button. Simply click on that to initiate a complete system scan. 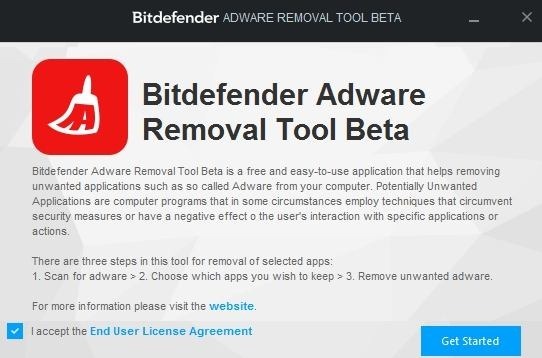 Now, Bitdefender Adware Removal Tool will try and identify potentially unwanted adware. It will list down all such programs (if any) that may affect the performance and integrity of your computer. Since, there are no custom options for the type of scan you want to conduct, the process may take time depending on the volume of files in your system, and it might be a while! Once the scan is complete, it will show you the results: total number of files scanned, found adware, and removed adware. In my case, the tool did not detect any issues, though I have Ask tool bar (which comes in bundled with another software that I installed), and a couple of add-ons installed on my browser (Maybe, they aren’t harmful or the Adware Removal Tool missed something that it shouldn’t). In case the tool detects programs with issues, you can select and get rid of those adware and annoying add-ons/toolbars, and leave those that you want to retain. Since, the tool did not detect any issues in my system, I cannot show the interface where adware are being removed. And I can’t even attest that it actually removes adwares! So, if you think you have an adware infested system, you will need to give it a shot and see if it detects something. 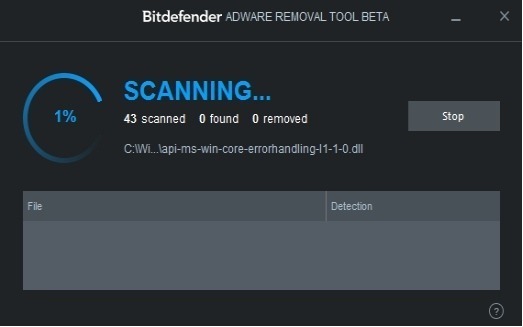 Bitdefender Adware Removal Tool is a fairly new software, which is still in its beta mode. It will be unfair to judge its performance now and as you can see, this review is based on my first impression of the software. Also, many people (including me) will expect the best out of this Adware Removal Tool, considering that it is a product of Bitdefender, one of the best internet security tools provider! Try Bitdefender Adware Removal Tool.